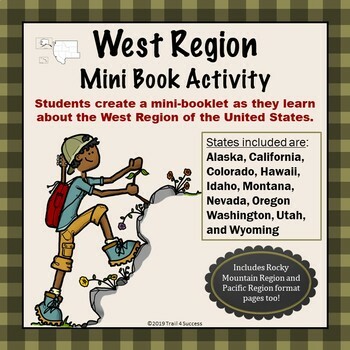 This US West region mini unit consists of 12 half page worksheets that students complete and assemble as a mini-book. 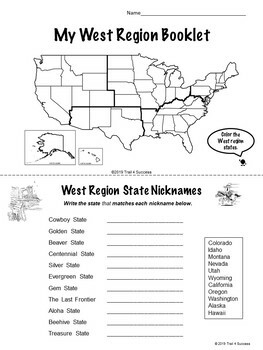 The worksheets also be used as part of an interactive notebook about the West region of the United States. Students staple the pages together once they have completed all of their information about the West region. Answer keys are included. Fun graphics have been added throughout to make it more student friendly. 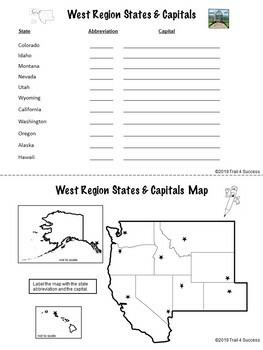 This unit is a great addition to existing social studies lessons about the West region, or it can be used as an informational reading research activity for fast finishers. "This was so helpful in my US regions unit!" "My social studies book was lacking and this rounded the lesson out perfectly! My students loved all of the activities!" "Perfect project to use for my ESL kids- helps them to visualize the information and create their own project!" "All of your Regions units are fantastic! I split the class into groups and each group worked on a region, then "taught" the rest of the class by sharing what they had learned. I used your units in conjunction with other Regions materials that I already had, included our textbook. Thank you so much for sharing!" You will receive notifications about upcoming sales and store updates. Follow my Trail 4 Success TPT store so you don't miss out.